As medical and recreational legalization has swept more states across America, additional methods for consuming cannabis are appearing alongside a rejuvenated cannabis culture. While plenty of customers and patients still prefer smoking marijuana flower or dabs as their primary method of intake, others choose to forgo combustion in favor of eating and drinking. Edibles chef salaries reflect a necessity for qualified bakers and cooks to fill the void in customer demand and product output. Marijuana edibles have been a constant presence throughout the continuous development of the cannabis industry, but have been largely rudimentary and made in home kitchens, rather than professional facilities. If classic stoner movies are any indication, edibles are mostly associated with bud-filled brownies, cookies and firecrackers, which are last-minute treats made in the microwave. Up until recently, edibles chefs salaries didn’t exist since the black market industry was responsible for all distribution. Thanks to expanding legalization, legitimate cannabis edibles jobs have become reality for old and new school cannabis cooks alike. Originally, edibles were made exclusively using “cannabutter” or oil. This pungent baking solution gives brownies an earthy taste, while getting you extremely baked. The process of making cannabutter is simple enough and only requires bud, oil/butter, water, a heat source and a pan. In order to activate the THCA and turn it into psychoactive THC, the cannabis plant matter has to be decarboxylated. Decarboxylating or, “decarbing” is carried out by introducing heat to cannabis flower for a period of time, usually three hours or more, in a fat-heavy substance (butter) and water until the maximum amount of THC has been activated. Keep in mind that cooking the cannabis at too high a heat can start to reduce the efficacy of the compounds. Once the cannabis has been fully infused into the butter, it is then allowed to return to room temperature, strained through a fine sieve, then allowed to cool. Even after straining, cannabutter is often still gritty and tastes strongly of plant matter. Though cannabutter isn’t the most popular method for making commercial cannabis infused edibles, some facilities use this method expressly for the reason of having a classic plant-forward taste. Edibles chef salaries are awarded to individuals with a confident hand over the cooking process. Especially when it comes to cannabutter, chefs must be able to accurate cook and dose out the substance without overwhelming the product with an unappealing taste. In the wake of cannabis legalization in states like Colorado, Washington and Oregon, concentrate creation has surged with demand for products with high levels of THC. As such, concentrates are the new standard for smoking and edibles infusion. Concentrates are created by extracting compounds, such as THC, CBD and terpenes from cannabis flower and other plant matter by applying solvents, heat and pressure. In many ways, cannabis extraction is just like making cannabutter in that the same decarboxylation process is applied; however, concentrate creation is a more skill-based position that carries a larger potential for danger. The goal with concentrate creation is to achieve the purest product possible. Cannabis extraction technician jobs call for experienced employees who do their best to achieve perfection. Whereas cannabis flower may contain up to 30% THC, concentrates can contain 80% or higher, depending on the level of purity. This high level of purity make concentrates ideal of edibles infusion, as chefs can more accurately dose their products. This is uniquely important since most commercial edible facilities don’t allow chefs to taste their products after the cannabis has been added. Edibles chef salaries reflect the legal weed industry’s focus on hiring the most qualified, passionate workers for each position. The variety of edibles available for sale is massive and chefs do their best to bring out the most flavor from their finished products as possible. There aren’t any hard and fast rules for what qualifications job seekers need to find edibles jobs, but edibles chef salaries range depending on the worker’s position in the hierarchy of the processing operation and the level of responsibility they have to take on. As Vocativ details, one thing has become clear–inexperienced candidates need not apply for edibles chef jobs. While there are a number of available positions in commercial edibles kitchens, every staff member should have relevant professional kitchen and cooking experience. Additionally, they should be passionate about cannabis and have a rolodex of cannabis knowledge on deck. Just like other sectors of the industry, following compliance measures to a “T” is absolutely necessary in order to keep operations running smoothly. Edibles chef salaries for entry-level and mid level workers range around $28,000-40,000, while salaries for sous chefs and head chefs reach upwards of $90,000 plus. Like any professional kitchen, cooks can work their way up the ranks in order to achieve supervisory or management positions. Regardless, every member of an edibles operation from the chefs to the dishwashers are important for ensuring success. Once cannabis edibles have been made and packaged, it’s time to be sent off to be sold in cannabis dispensaries. Dispensaries are the main way medical and recreational customers obtain their cannabis products. Therefore, edibles processing companies have to establish a strong brand in order to successfully compete against other edibles creators. Companies send sales representatives from their facilities to dispensaries. Armed with samples and a compelling pitch, these cannabis industry jobs for extroverts are integral in forming accounts and bringing in revenue. The cannabusiness has a lot of opportunity for making top dollar, but still requires industry workers to give it their all. For the most part, edibles kitchens can only form accounts with dispensaries in the same state, limiting the amount of opportunities for business partnerships. For this reason, sales reps are key players in the success of edibles chef jobs and must be confident in their ability to communicate with clients and follow through with business deals. Even after edibles have been cooked and tested, processing companies have to make sure that the levels of THC present are as exact as possible and are in keeping with state laws regarding concentration. Looking at some companies’ edible packaging, you can see how blatant the labeling and information must be in order to follow regulations accurately. Recently, much has been written on how difficult it is to truly ensure exact consistency in the concentration levels of edibles. Even when the label gives a breakdown of the amount of THC infused, there is significant possibility for variation from one product to the next. Additionally, in cases where third party testing is called upon to ensure compliance, it’s still difficult to assess the consistency of an entire line of products. Commercial edibles kitchens are given inspections by regulators, but this is more to ensure chefs and management are following daily orders correctly. In addition to cannabis regulation concerns, chefs also have to maintain strict food handling protocol as they are also inspected by state health departments for food based facilities. 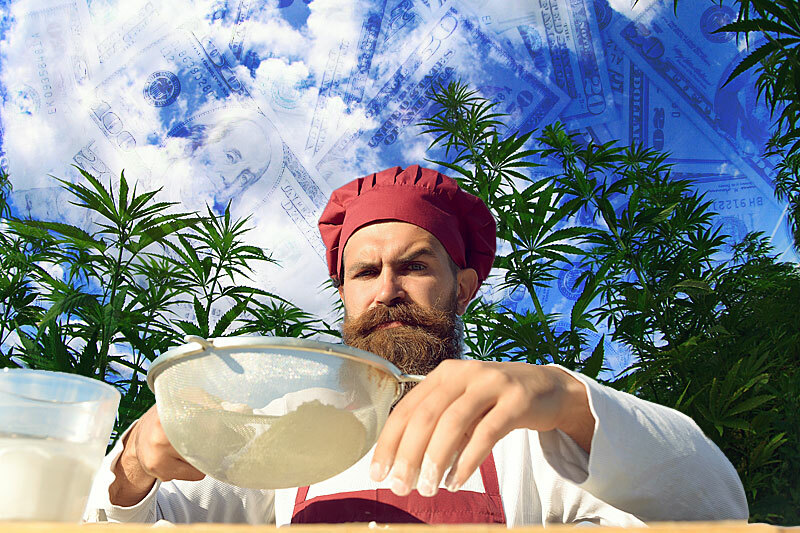 Another way cooks are making significant edibles chef salaries is by releasing cannabis themed cookbooks. While these cookbooks are mostly geared toward home cooks using cannabutter, authors are releasing incredible recipes for baking treats and cooking extravagant meals that can be attempted by novices from around the globe. Cannabis cookbooks have appeared as an offshoot of cannabis bloggers who share their individual experiences and tips for cooking with pot. Especially in regions where cannabis edibles are not legal or easy to access, many individuals are stuck making their own cannabis infused creations, making cannabis blogs extremely popular and financially lucrative. This is also evident in the health and fitness sector of the internet where health advocates provide readers with edibles recipes that are healthy, gluten free or vegan. Essentially, bloggers can adopt any recipe or food trend and infuse cannabis and suddenly, their viewership blossoms. Not only are edibles a fun and discreet way to consume cannabis, they are especially important for medical marijuana patients. In the case of elderly patients or those with lung and other respiratory problems, edibles are the primary way cannabinoids like like THC and CBD can be administered into one’s system. The legal marijuana industry is experiencing a period of exceptional growth. Given how novel it is and how great the interest is surrounding it, the cannabusiness is garnering more attention than perhaps any other industry in the United States. Cannabis publications and websites are being flooded with traffic; hundreds, if not thousands of dispensaries are finding homes on the west coast, in Colorado, and now, in more areas on the east coast and throughout the midwest. Given the high quality of current edibles production, along with similarly augmented prices, edibles chef salaries will likely grow in concert with inflating demand and increased qualifications required to find work. Not unlike what the cannabis cultivation sector is experiencing, more and more college educated and certified individuals are seeking gainful employment in the cannabusiness, driving competition for positions skyhigh. Even finding a job in entry level marijuana jobs as a budtender or receptionist in a marijuana dispensary involves potentially competing against hundreds of other qualified applicants for few spots. Edibles chefs will continue to bring the cannabis industry under a more credible microscope as they prove their ability in following compliance and producing a great product. Chefs know how great of an impact their work has on the medical marijuana community and the world at large, making it evident that this job will be highly pursued for years to come.